Read how your Presidente got an engine transplant! It all started last year when my bell housing broke and the starter motor fell off. 'Engine fatigue after only 28 years', I thought? 'And am I not tiring of being last in my class at the autocrosses'? Some car nuts lust for fast new cars, I lust for old cars that go fast. Nothing is better for everyday driving and great handling than a 74 GTV but less than 120 hp means someone else's dust is in your windshield all the time. 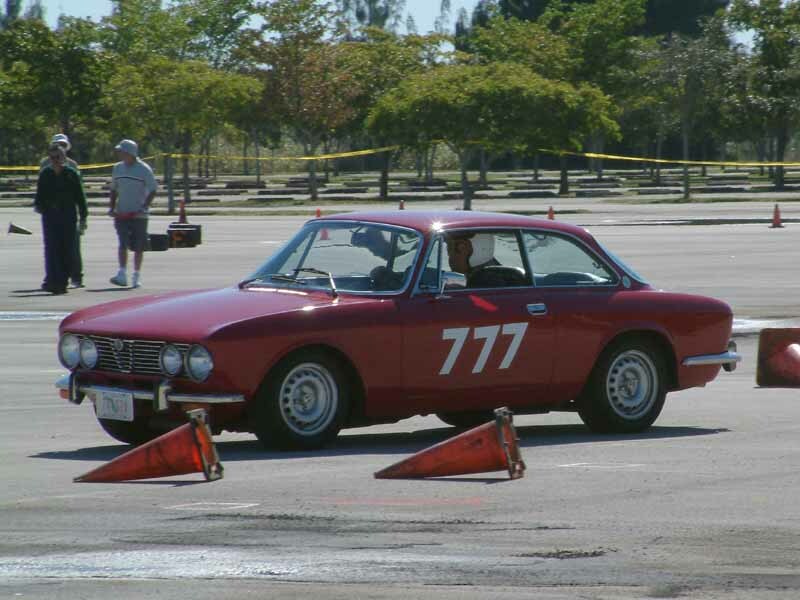 Looking for an excuse to make my GTV go faster I went to an Alfa club meeting and got advise from the maestro, Richard Sirgany, of Auto Volante in Miami. "Richard", I pleaded, "please make my GTV go fast". He explained that a 2.0 liter Alfa engine can be made to develop gobs of horsepower but each added horse costs more and more money and in the end I might not be able to comfortably drive the GTV in the street due to the radical modifications. And then he suggested, "Why dont you get a modern Twin-Spark Alfa engine?" "Will it fit? ", I asked. "No problem", Richard explained, "because the block hasnt changed in nearly 40 years, it will even fit on the same motor mounts". And he went on to say, "and you'll have lots of power and a smooth running GTV". I went home that night and dreamt of my Twin-Spark GTV digesting Porsches at the autocross. The next day I headed for my computer and started searching the world for a modern Twin-Spark Alfa engine. On the internet I found the website of Alfa Centro and read all about a twin-spark conversion on a spider. 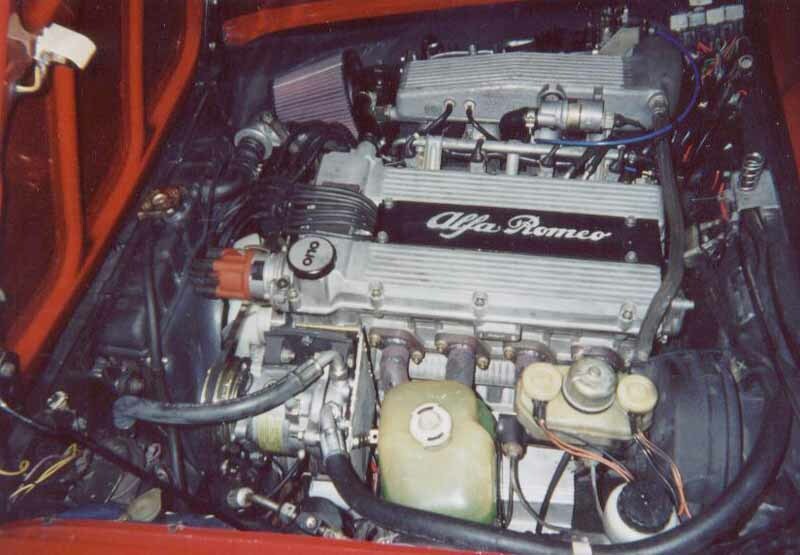 There I also learned that the engine to find was that of a European Milano 2.0 (the Alfa 75) with rear-wheel drive. The stock engine from the factory turns out 148 hp (Euro horsepower) at 5800 rpm and propels a Milano to 127 mph and 0-62 mph in under 8 seconds. Wow! I imagined what it could do for a GTV that weighs nearly 600 lbs less! I couldn't sleep that night. What to do next? To buy a new engine in Italy might be impossible as they stopped making the rear-drive 2.0 liter engine in 1991. To buy a rebuilt engine in Italy was risky. Who knows how well it was rebuilt? Finally, I decided I would comb the junk yards of Italy and try to find an engine from a wrecked Alfa 75 and have Richard Sirgany rebuild it. The internet is an incredible tool. Within the day I found a list of junkyards with websites in Italy. An email to those junkyards yielded two responses. Both had what I was looking for. A quick phone call, some negotiating and I ended up buying not one but two engines as Richard wanted one for himself. A few weeks later the engines were flown in and we examined our loot in Richards shop. They were beautiful and Richard went to work. It was an amazing endeavor. Yes, the engine fit under the hood - by about 1/16 of an inch. Yes, the engine was a bit too long as the second distributor (one for each four plugs) protrudes off of a camshaft in the front so we had to move the radiator forward an inch. No, the cast aluminum sump on the new engine doesn't fit the chassis of the GTV so the problem was solved by replacing the modern sump with the old sump from an old 2.0 L. engine. And the tachometer what to do about the tach? Modern cars dont have tach cables attached to water pumps, they have electronic sensors. Did this mean I was to lose my tachometer or have a new ugly one hanging under my dashboard? The problem was solved by replacing the modern water pump with an old-fashion one with a tachometer connection. It fit! One by one the solutions to small problems were found. My GTV Twin-Spark now has nearly 3000 miles on a well broken in engine. Although she handles like the thoroughbred GTV that she is any resemblance to a 74 GTV's performance stops there. After porting, polishing, valve work, balancing every engine component and creating new 25" racing headers, Richard estimates that the engine must be developing at least 165 hp and probably 175 hp. At 2300 lbs, my GTV now has a weight to power ratio equaling or bettering that of a '70s era 308 Ferrari. Driving is an awesome experience. The car starts in a half turn of the key and settles down to healthy purr. 2000 rpm in 3rd or 4th gear throws off enough torque to make you grin and wonder why the first two gears are necessary at all. At 3000 rpm in 5th you start feeling big G-forces and hear a roar change to a bellow and notice youre breaking speed limits on I-95. Before you know it youve passed 5800 rpm and are pushing 7000 while risking jail time on the freeways. If ever there was an Italian hotrod this is it. I doubt if Ill ever want a different car, new or old. I can't imagine a better automotive investment than a Twin-Spark GTV. By the way, Richard loves this engine and will build more of them for those of you who can no longer live with out one.